Petr Konchalovsky is a famous talented Soviet painter. In addition to working in a creative workshop, he loved his native nature very much. Therefore, the artist was also known as a wonderful gardener. Nothing distracts the eye when contemplating the picture of the lush blooming little buds. In soft contrast, the background of the canvas is separated from the wooden table on which the basket woven with willow rods is placed. The background wall is greenish yellow, heterogeneous. The table is quite dark, with a noticeable shadow falling on the left under the bouquet. A window open on the right outside the image gives a stream of morning light. 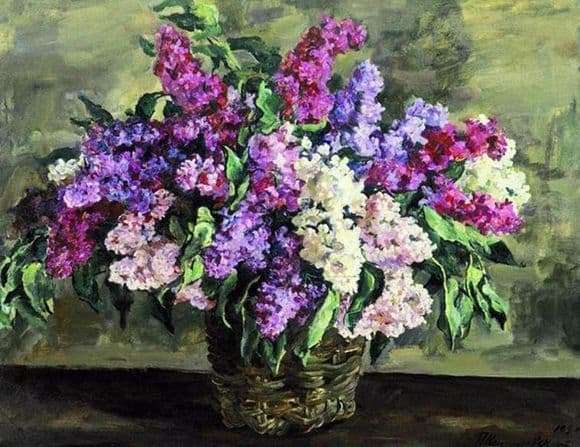 The bouquet itself seems to be composed by a skilled florist: it contains all the diversity of the lilac bushes palette. Pale white flowers coexist with purple, light pink, dark lilac and rich burgundy. The bouquet is diluted with large leaves of a bush. Konchalovsky did not stop in one direction of painting. One of the experiments in the style of impressionism was “Lilac in a basket.” The still-life conveys to the spectators the fleeting moment: here the lilac just ripped off, a few more moments – and the buds that did not have time to bloom will bloom, and tomorrow they will begin to crumble and die. The artist managed to convey his warm love for blooming nature, the first May lilacs tell us about the triumph of spring, about awakening, about the morning and the sun. A lush, colorful bouquet attracts attention and does not let go; it gives up, even the aroma comes from this fresh bouquet. The picture is simple, but so emotionally rich, like all the ingenious creations of the Impressionists.